Lock in a great price for La Quinta by Wyndham Moab – rated 8.7 by recent guests! We liked that they let us checked in early. We arrived early before 3pm from SLC. The guy in the desk was kind enough to give us a clean room that they have available. Large clean room and full facilities on site. Breakfast was better than expected. Everything was really amanzing. I love the place very clean. Staff was very friendly to myself and dog. Rooms were clean and spacious. They had an area with grass for dogs to stretch their legs. Very pet friendly. The staff was friendly. The breakfast was good. Easy check in and check out. The staff was very friendly. They were pet friendly. My dog is a service dog and my wife's dog is her pet. Both were welcomed. My service dog is a PITT BULL! He was told he looked cute by the front desk. EXACTLY!!!! The cleanliness and the dog area. The price was great. The room was very clean. The bed was comfortable and it was very quiet. La Quinta by Wyndham Moab This rating is a reflection of how the property compares to the industry standard when it comes to price, facilities and services available. It's based on a self-evaluation by the property. Use this rating to help choose your stay! One of our top picks in Moab.La Quinta Inn & Suites Moab is located west of the La Sal Mountain Range in the Moab Valley. The hotel offers a seasonal outdoor pool and rooms with a flat-screen TV. Arches National Park is 15 minutes' drive from the property. Moab La Quinta Inn & Suites rooms include a microwave and refrigerator. The rooms also have free WiFi. Guests at the La Quinta & Suites Moab are provided with a breakfast buffet. After breakfast guests can relax in the hot tub or work out in the fitness center. The hotel also has a business center. Mesa Arch is 8.7 mi from La Quinta Inn & Suites Moab, while Landscape Arch is 9.9 mi from the property. When would you like to stay at La Quinta by Wyndham Moab? La Quinta Inn and Suites Moab, off I-70, is a mile away from Footprints Tech Suite, Hogan Trading Company, Lema Indian Trading Company, and others. Canyonlands Airport is a 10 minute drive. Rooms feature microwaves and refrigerators. 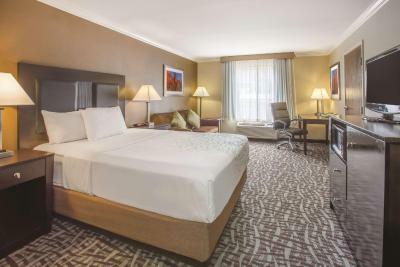 Free Ultra Fast wireless internet, daily free Bright Side Breakfast, free parking, business and fitness centers, barbecue grills, and a guest laundry. Meeting room seats 80. All rooms nonsmoking. House Rules La Quinta by Wyndham Moab takes special requests – add in the next step! La Quinta by Wyndham Moab accepts these cards and reserves the right to temporarily hold an amount prior to arrival. Very central with friendly staff. Restaurants in walking distance. Clean, comfortable rooms. Would stay here again without hesitation. Unlike other LaQuintas, they charge for a rollaway bed. Friendly staff and solid location. Walking distance to everything in town. The rooms were cold and hard to get them warm, not enough blankets available. We liked the diversity in the choice for breakfast. We enjoyed the easy access of the place. The Continental Breakfast was pretty good. but after staying there for five days, I would like to see more variety for the main course. Every morning it was scrambled eggs, potatoes, biscuits and gravy, and the same sausage. I would like to see some bacon, maybe a cheap version of an omelet, maybe options for a breakfast burrito, different sausage. Any change in variety would be good. The staff was very friendly and attentive. I have stayed here in the past and would recommend it to others.